I am pleased to forward information on my published title, Copyright Litigation Handbook, 2012-2013 ed. This handy, portable desktop volume is a comprehensive guide to copyright litigation from pre-litigation practices including evaluating claims, interviewing clients, working with the U.S. Copyright Office to drafting cease and desist letters and choosing the correct forum and claims, together with case law related to seizures, bonds and related practice. Copyright Litigation Handbook, 2012- 2013 ed guides you through the process of filing acomplaint, taking a case to trial, and obtaining judgments and attorneys fees. The New York Law Journal called it “an indispensable guide”. No other publication covers this intersection of the Copyright Act with the Federal Rules of Civil Procedure. It contains case citations and practical tips related to motion practice, pre-trial and trial procedural tips, checklists and forms. Appendices include the entire Copyright Act, the Federal Rules of Civil Procedure and the Federal Rules of Evidence. Complete information regarding Copyright Litigation Handbook, 2012-2013 ed. is available through the link provided below. Since its first publication in 2006, this work has almost doubled in size and is updated annually. I hope that beginners will find guidance and that experts will find it a useful time-saver. This publication is a desktop practice guide for litigators, handily sized for portability. Featuring practical, detailed guidance from an experienced federal trial lawyer, it walks attorneys step-by-step from the moment a prospective client calls, through the calculation of costs and attorney’s fees. It is packed with sample forms, pleadings, motions, checklists, and practice tips; and includes up-to-date citations. 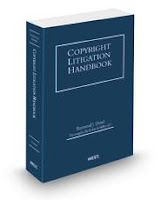 The Appendix includes the full text of three essential documents for the copyright litigator: the Copyright Act, the Federal Rules of Civil Procedure, and the Federal Rules of Evidence. A valuable resource combining real-life tactics, legal analysis, and primary law. 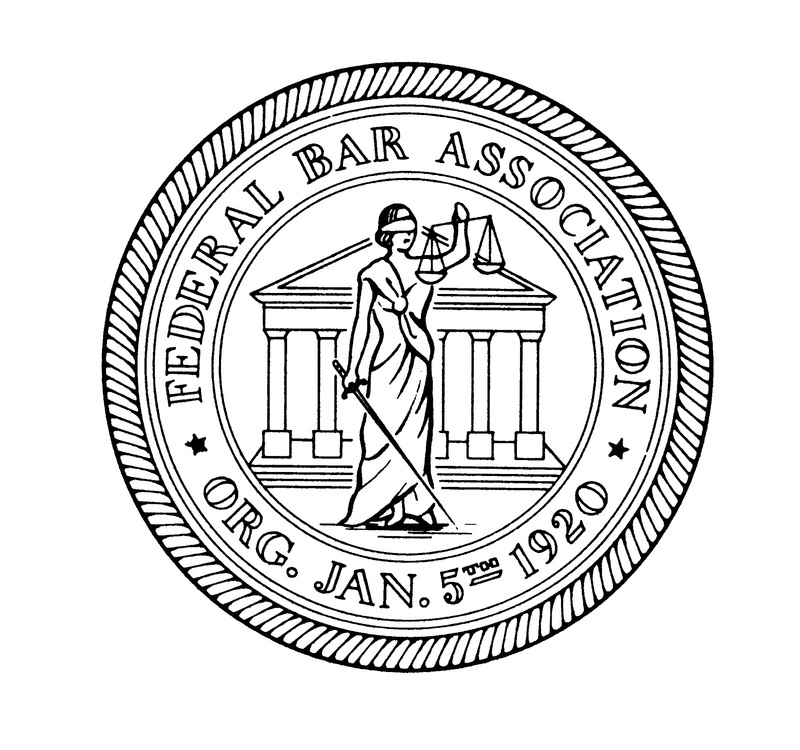 On Friday I will be in Hawaii to announce the launch of the Federal Bar Association's Rule of Law video contest at the Fourth Annual Federal Bar Association Hawaii Conference. Thanks to Above the Law blog for covering the launch here. The FBA's Annual Hawaii Conference brings Hawaii's federal judiciary and leading legal practitioners together each year at the Royal Hawaiian Hotel. Please join the FBA today! More information here. Below is the description from the West LegalEdcenter website, more information and signup here. Description: Ray Dowd, author of West’s acclaimed Copyright Litigation Handbook and a partner in Dunnington Bartholow & Miller LLP in New York City will take us through the surprisingly complex process of deciding whether an action belongs in federal or state court and whether claims are properly pleaded under federal or state law. The situation: client storms in wanting a lawsuit filed tomorrow over a copyright dispute. What court should it be filed in? Do the claims “arise under” the Copyright Act or are they really state law claims? If you are not sure, should your complaint plead lots of “kitchen sink” state law claims? Another situation: your client has been sued in state court. You think it’s a federal case. How do you kick it out (remove) it to federal court? And what are the downsides if you are wrong and the case is remanded to state court? Conserving and focusing litigation resources at the outset of a case may save a client thousands of hours of litigation anguish. 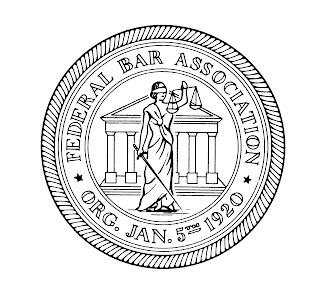 Dowd walks practitioner through some of the tactical and strategic choices that a litigator faces in understanding the interplay between the federal and state fora and legal regimes. Dowd’s entertaining presentation will clue you in to some of the tricks and surprises that may cut off the rights of the unprepared. The Copyright Act and the Federal Rules of Civil Procedure interact in ways that may help your client to turn early skirmishes into decisive victories. The New York Law Journal called Dowd’s Copyright Litigation Handbook “an indispensable guide and supplement to the ins and outs of copyright litigation…”. Join us for a lively session on a hot topic. For more information on Copyright Litigation Handbook 2012-2013 ed, please visit the Thomson Reuters Westlaw Store here. Moderator: Hon. Nicholas Garaufis, E.D.N.Y. Moderator: Hon. Helen Freedman, App. Div., First Dept. The Appraisers Association of America starts its national convention tomorrow at the New York Athletic Club. My firm Dunnington Bartholow & Miller LLP is sponsoring tomorrow night's cocktail, we hope to welcome everyone there at Bonham's auction house. 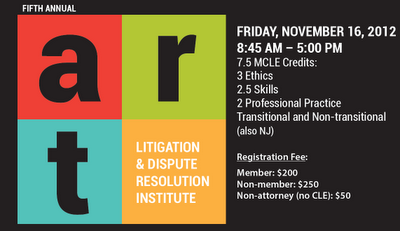 Non attorneys may attend the program for $50. register above as "Law office Staff"
Join a faculty experts from the bench, bar, academia, art galleries, insurance agencies, art consultants , government and non-profit organizations as they take you through the most relevant issues in today's art world, including how to deal with the ethical issues that arise. I hope you can join us! Thanks to the Federal Bar Association ND California Chapter and Intellectual Property Law Sections for hosting and to the Northern California Chapter of the Copyright Society for promoting the event. so invite your friends and colleagues. Please also send an email to bdunne@owe.com confirming your attendance and the number of your party. Cost to attend is $45 per person for FBA members and $55 per person for non-members. Via live online format, or accessible up to 180 days after the event. To get 25% off the market price for each program! The program is designed for any practitioners involved in sending cease and desist letters related to any conduct including breach of contract, nuisance, trademark, copyright, domain name, patent and other disputes whether related to intellectual property or not. Raymond J. Dowd is a partner of Dunnington Bartholow & Miller LLP in New York City, and author of The Copyright Litigation Handbook. The situation: a client wants a quick and dirty letter but does not want to pay much for it or think too hard on it. Is a cease and desist letter a recipe for a cost-effective settlement? Or will it snowball into a professional embarrassment, with the client getting hit with a lawsuit in an inconvenient forum? Dowd, a seasoned litigator, takes us through the ethical, tactical and strategic considerations and choices to be considered before a practitioner sends a cease and desist letter. What warnings should you give the client before proceeding? Would it be better to commence a local declaratory judgment action? Why or why not? What is the first-to-file rule and how can a practitioner try to craft a cease and desist letter to best balance the client’s objectives? What are the risks of suit in a foreign jurisdiction by the recipient of a letter and how does one get out of the pickle without getting sanctioned? Is your cease and desist letter going to be publicly mocked by well-organized bloggers who have systematically attacked overreaching by IP owners? Dowd’s Copyright Litigation Handbook is the first publication to deal seriously with the interplay of cease and desist letters and declaratory judgment actions, devoting attention to case law that rarely reaches the appellate level, but is of critical importance to the life of everyday practitioners. The New York Law Journal called Dowd’s Copyright Litigation Handbook “an indispensable guide and supplement to the ins and outs of copyright litigation…”. Join us for a lively session on a hot topic. For more information on Copyright Litigation Handbook 2011 ed, please visit the Thomson Reuters Westlaw Store. Had a great day as a speaker on a panel called "The Picasso Project" about the Google Art Project. Terrific moderator LeeAnn Shelton, and co-panelists art expert Alexandra Darraby and Houston Museum of Fine Arts in-house counsel Carlotta Rodriguez. Very interesting debate and issues on the future of museums and the internet. 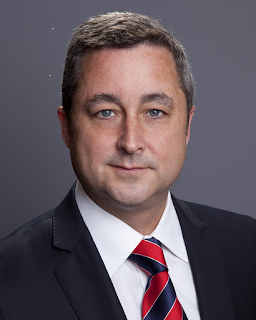 Ray Dowd, author of West’s acclaimed Copyright Litigation Handbook and a partner in Dunnington Bartholow & Miller LLP in New York City will lead us through the process of investigating, analyzing and documenting a copyright litigation from the initial client interview. Dowd, a seasoned litigator, takes us through a pre-flight litigation checklist designed to avoid potential pitfalls that may arise before a copyright litigation is launched or when your client is sued. Does your client have a case? If so, how well is it documented? Have you reviewed the client’s claims and documents before actually filing the complaint? What evidence do you need before moving ahead? Does your case belong in federal or state court? This course will cover how to pick the right courthouse, analyze copyright terms, statutes of limitations and how to get an idea of whether attorney’s fees may be available. Initial considerations from the defendants’ perspective will be considered, together with some potential strategies for quickly finding the holes in your adversary’s case. Don’t wait until you are in a courtroom to realize that preparing copyright cases requires special attention. Copyright litigation has exploded as the world has become digitized. This course will assist you in navigating potential minefields. Does your case belong in federal or state court? This course will cover how to pick the right courthouse, analyze copyright terms, statutes of limitations and how to get an idea of whether attorney’s fees may be available. Initial considerations from the defendants’ perspective will be considered, together with some potential strategies for quickly finding the holes in your adversary’s case.